Build an interdisciplinary roadmap on human vs machine intelligence, potential algorithm’s impact on human cognitive capabilities and decision making, and evaluation and regulation needs. Identify future research challenges and practical way to address them. Build a community of researchers for the HUMAINT project to collaborate with. Explore research synergies between this community. Workshop information and details were published at the Science Hub event page. 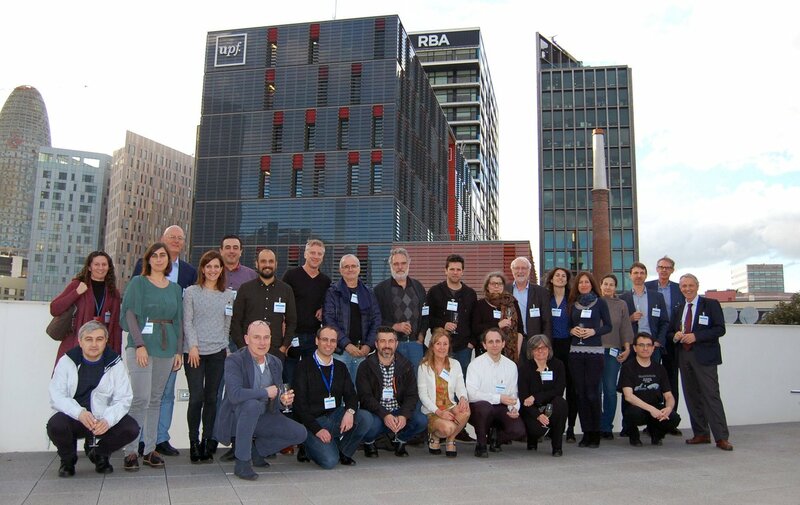 The workshop gathered more than 45 experts from research and industry working in different disciplines, including neuroscience, psychology, computer science, philosophy, economy, law, health and music. The program was based on a set of short presentations followed by some panel discussions. Which are the fundamental differences between human and machine intelligence? How do algorithms complement or replace human tasks now and how will they do this in the future? Will algorithms that take over some of our tasks affect the balance between human and machine intelligence? Joan Serrà. Unintuitive properties of deep neural networks. Gustavo Deco. Whole brain modelling and applications (slides pdf). Karina Vold. Extended minds and machines (slides pdf). Rubén Moreno-Bote. Slow and fast biases in decision making (slides pdf). How do algorithms, when exploited in different applications, affect human cognitive capabilities? How do algorithms have the potential to modify the way humans make decisions based on them (e.g. influence of recommendations, personalization)? Which are the suitable strategies for effective human-algorithm interaction? Henk Scholten. Digital Transformation – Governance of human societies. Nicole Dewandre. Artificial intelligence: an interesting leverage point to rethink humans' relations to machines…and to themselves (slides pdf). Carlos Castillo. Algorithmic discrimination (slides pdf). Fabien Giraldin. Experience Design in the Machine Learning Era. How should algorithms be evaluated in a research vs industrial context? Which are policy needs in terms of the usage of algorithms into real applications? Which is the research needed to support these policy needs? Alessandro Annoni. Digital transformation and artificial intelligence: the policy-oriented perspective. Martha Larson. Reality, requirements, regulation: points of intersection with the machine learning pipeline. Anders Jonsson. Benchmarks and performance measures in artificial intelligence (slides pdf). Ansgar Koene (UnBias project). The IEEE P7003 Standard for Algorithmic Bias Considerations (slides pdf). Heike Schweitzer. Algorithmic decision-making by market intermediaries - in need of (which) regulation? Presentation of several application contexts where there is an interaction between human and machine intelligence. Sergi Jordà. Enhancing or Mimicking Human [Musical] Creativity? The Bright and the Dark Sides of the Moon (slides pdf). Miguel Ángel González-Ballester. Machine learning in healthcare and computer-assisted treatment (slides pdf). Fabien Gouyon. The influence of “intelligent” technologies on the way we discover and experience music. Blagoj Delipetrev. HumanAI (slides pdf). Luc Steel. Will AI lead to digital immortality?